Smart Internet of Things (IoT) in transit service has public transits connected to the networks accessible via internet. The networks connect to each other also the external environment to share data picked up by sensors on the transits themselves, offering many benefits to improve public transportation. 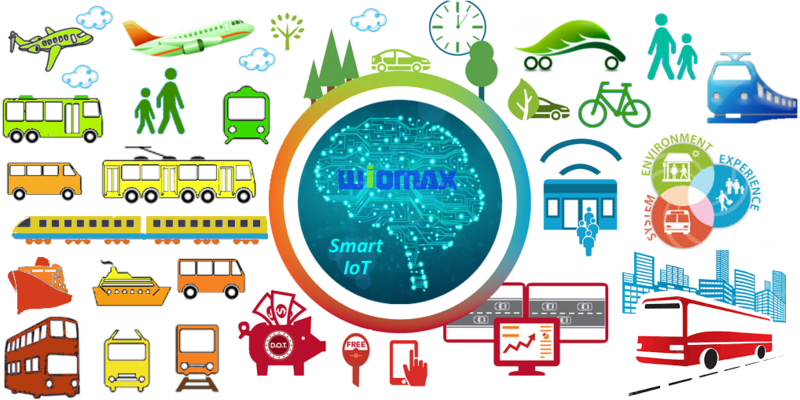 Supported by the smart IoT connectivity integrated with Artificial Intelligence (AI), various on-board systems for transit vehicles have emerged, making the transit system more reliable, convenient and efficient for passengers. Multiple plane, train, metro, and bus companies have started using smart IoT in their services to enhance the customer experience and to help operations and maintenance. One good example is the Utah Transit Authority (UTA), which has provided a smart connected public busing service across a 1,600-square mile service region serving 80 percent of Utah’s entire population. Smart IoT enables transit authorities to support real-time route, schedule management and service information on vehicles and in bus depots, to provide passengers the option to pay fares with credit cards and to validate bus passes, and even to develop contingency plans or make alternative rides for the area with unforeseen circumstances or events, such as too many people are waiting for the bus, or the bus is not moving, etc. Moreover, the traffic and transit data analytics from smart connected public transportation systems can deliver warning and notifications of an unexpected event, real-time vehicle tracking, and even personalized travel information help to passengers. Given public transportation is disrupted by unanticipated circumstances like vehicle breakdowns, road closures, reschedule of a particular route, or hazardous weather, passengers will receive personalized alerts corresponding to their trip or plan at the earliest time. Smart IoT with embedded big data analytics can update passengers on the transit information throughout their travel to make their trip safer and better customized. With smart IoT access on-the-go, passengers can be notified about their required activity ahead of time, such as alerting the exact time their ride will arrive, their stop is approaching therefore be prepared to deboard, etc. Smart IoT can also provide data to help developing sustainability in transportation and protecting our environment. Public transit is usually more green than traveling by a private vehicle. However, many people often prefer to commute with private vehicles even though public transit is much cheaper. This is because public transit may not be as comfortable, convenient, or even in some cases as reliable as a private vehicle. For instance, unforeseen operation circumstances may disrupt public transit timetables around which passengers have planned their travels. Thanks to smart IoT, numerous ways have been found very effective to make public transit much better in practice. For example, passengers using public transportation system may be provided real-time public transit information obtained from sensors on parking, routes and current road incidents to avoid congestion and to have a better adaptive navigation. The smart IoT driven improvement in public transportation system will encourage more people to commute with public transit and to drive cars less time and less often, leading to not only the less congested cities to us, but also a great reduction in harmful carbon dioxide gas emissions that damage our environment. Advocate of Smart IoT in transit service will continue to improve public transportation in reliability, safety and sustainability. More transit authorities utilize smart IoT, the better the public transportation is, therefore more people will choose to travel with public transportation, and more sustainable cities we will have.